You’re Fireproof, Nothing Breaks Your Heart. It’s been a dreary and cold day here and I’ve spent all afternoon listening to The National. I did, however, want to show you a few new pretties. FAKE has released a new skin line named India. She comes in 8 tones with ginger, brunette or blonde brows and 5 makeups. Also available are Slink hand and feet appliers, Lolas appliers and Phat Azz appliers. Below I’m showing off the Ginger brows with freckles but please continue reading because I’ve got quite a few photos today. I’m also wearing fri. boots which have become my new favorite pair of lace-up boots. I love the slight wedge heel, I’d definitely wear them in RL. These are available now at Shoetopia. A better view of the fri. boots. Today I’ve got a peek from two upcoming events beginning December 1st. First, Adorkable is participating in The Arcade once again and I LOVE these gift poses. Nine poses will be up for grabs and each one is accompanied by a texture change gift box along with a grayscale one for your complete customization. How awesome is that? Secondly, Lilo outdid herself creating Zima for the Winter Fair and today I’m showing just a little taste of what this beauty has to offer. If you purchase the full skin pack you’ll receive 5 skins with and without cleavage, 4 eyebrow colors, 14 lipstick addons, 2 blushes, shape and the new soft eyes in brown. Of course you can always purchase each skin seperately if you so desire. These are the 5 base skins of Zima along with the new soft eyes. The photos below were taken with Strawberry Singh’s original windlight, no editing was done. I’ve got a few new things to show you. Filthy has put out yet another amazing skin called Melody and I’m gonna show you it in my fave skin tone, cream. Mhmm. I’m sure you know by now that I have a boot addiction so when these new boots from MIEL came out I had to have them, very simple to mod, I heart them! ❤ Spirit Store has me in love with her new Jeans and her teeny tiny new skirt, I wanna lick them both. One more thing…I was told I don’t look good in red…tell me what you think. I love vintage, so so much, which made me have to check out the latest themed discount shop called My Attic. This round’s theme is Summer Abroad 1955-1960. Some great finds there at only 95L each. Also, Whore Couture Fair is coming to an end but some of the designers are putting out newness for the last 2 weeks and SuPerBia was my fave so far, I’m lovin’ up on this new bag. You might want to see what else there is to be had before it’s gone. I think I’m starting to love mesh more than I ever thought I would, sneak a peek below for the rest of the goodies. Hurray for new stuffs! There is a new event coming up and it’s full of your fave meshilious designers! It starts March 1st and i’m gonna give you a sneak peek of who’s gonna mesh your head up. 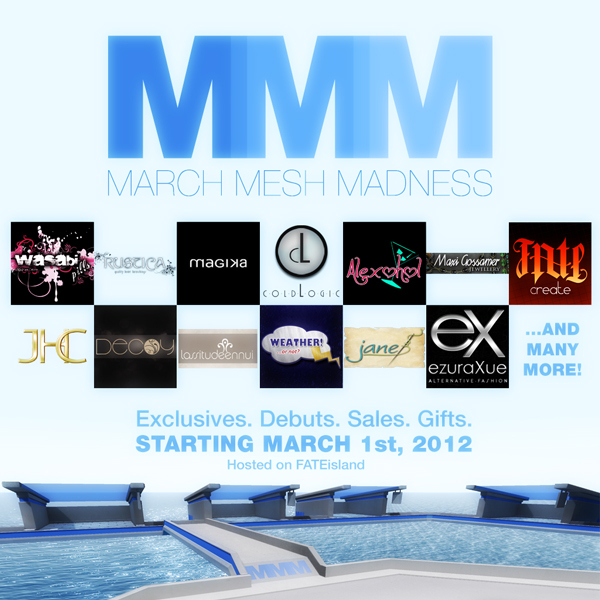 Here’s where you will find the goodies… March Mesh Madness.